The color was more of a muted reddish brown. From the picture I expected it to be more vibrant. It's still a nice rug, very soft, non shedding. I just hoped it had been brighter. This rug is thick and soft. It sheds a little in the beginning, but it is expected. The colors are more muted than the computer screen shows - the orange is a soft rust and the green is an olive. It is a very beautiful rug. It will work in a traditional setting, an Arts and Crafts or slightly modern. We have an Olive green sectional and dark wooden prices and the rug works beautifully. It looks like a much more expensive rug. COLORS ARE NOT EVEN CLOSE!!!!! If the PHOTO of this rug appeals to you, then it will NOT be what you're looking for when you get it in person. I REPEAT! DO NOT order this rug if you care about color at all! This rug looked so different that I assumed it was the wrong rug, but the pattern matched up, so even though it came as a DARK, MUDDY Burgundy color, it was the correct item. The actual rug is drab, muddy, boring, and downright ugly. I was beyond disappointed. The only good thing about this shopping experience was that Overstock allowed me to return the item with free shipping. Ugh, I really wish this rug looked like it does online. It looks great in the photo. We love this new rug. It does shed a bit, as would any new wool rug. Two points of concern: It seems like it was made in India--and in our imagination, by small children. A much more minor concern is that it really isn't orange--it's a deep pinkish red. Otherwise, it's beautiful! The color is NOT true to the picture. It is not at all"rust" - it is almost a muted cranberry color. However, for me, if it had been rust it would have clashed with the 75 year old hardwood floors in my house. So the fact that the color is more cranberry turned out to be a good thing. I have had it down for 6 months in a high traffic area and it is wearing extremely well. It is a beautiful rug and looks great!!! When I saw the rug on Overstock I knew it would be a great match for my new furniture. The colors were perfect, in fact I have ordered two others. It does shed some, but overall I am very happy with the rug. The rug is of a completely different color than shown in the picture ... darker and more brownish/marooninsh than the orange we were looking forward too. Quality is okay ... what you would expect for an inexpensive rug. Had to return it . I bought this because of the pattern and the color. I have a odd salmon coloured wallpaper I'm trying to match to. This carpets color is more brown than orange and not salmony enough for the application I need it for. It is exactly as it appears in pattern in person as in print. Again the color is not easy to describe. It is still beautiful and will end up in another room because of that. Very nice rug for the money but I am disappointed in the color as many other reviewers have pointed out. Big thing I noticed is the pattern is not at all like the picture. I may return it. BEAUTIFUL! Very nice rugs - lots of colors but muted. Have held up well except they will fade in bright sunlight. It was exactly as described and arrived promptly! The value is outstanding and I know we will enjoy it for many years to come! 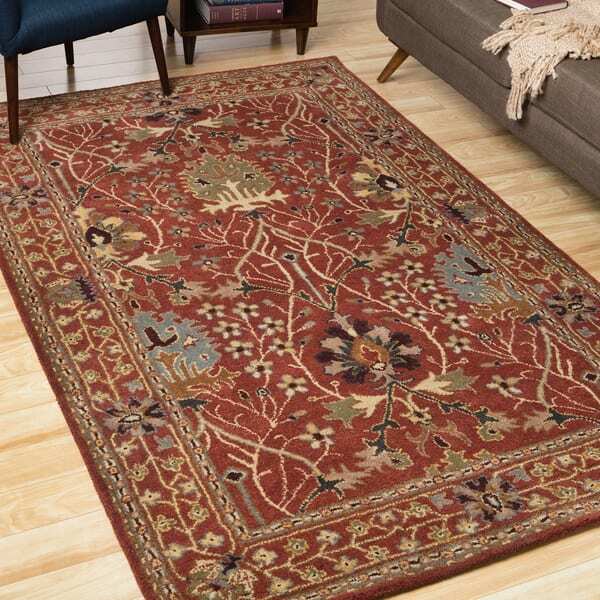 "The red in this rug looks very dark red, even a burgundy. But the description is Rust. Can you please look at it and see if it is orangey or brick colored as Rust implies. Thanks"
Hello silverstuff182, we try to represent the colors of our products accurately. Unfortunately, due to the difference in monitor colors we cannot guarantee that the color will match exactly what you see on your screen. On reviewer of the product said the color of the rug is a soft rust. Thank you for shopping with us. "Does this rug come in a size close to 9 X 12?" Hello Hal1954, we do not currently have this rug in a larger size. Thanks for shopping with us!